As Kenyan troops fight al-Shabab militants in Somalia, the extremist group's propaganda machine is targeting disillusioned young men back home in Kenya's poorest neighbourhoods. He was recruited by al-Shabab but if you were to see him in his Spanish football shirt and a baseball cap emblazoned "New York", he would look like any other young Kenyan. What is also unremarkable about this young man is that he says he only joined the Islamist militant group in Somalia, where he was based for two years, because they offered him money. Three women we met whose relatives all went to fight with al-Shabab in Somalia told us their relatives had gone to fight in Somalia for the same reason. The 24-year-old former recruit we met, whose identity we are protecting, says he was paid more than $1,000 (£640) to join the group. Media captionAnonymous former al-Shabab fighter: "It was all about business, not jihad"
When he was 18 he was recruited by al-Shabab while he was living in Nairobi's Majengo slum. The conditions there are cramped and squalid. The metal box-like corrugated iron shacks can hardly be called homes. Kids play around the stagnant mess inside the neighbourhood's open sewers. These dusty litter-laden streets are fertile ground for recruiters. The young man we met described al-Shabab as a "business". He says he was trained in religious schools in Somalia and the one-off payment he received was akin to a "salary". He insists he did not travel to Somalia because of ideological beliefs or jihad but simply because of the money. "If I had had a job, I would not have gone there," he says. The young man we met claims he never killed anyone and when he realised that he would be expected to kill he wanted to leave al-Shabab. During his time with the group he says he did help smuggle arms across Somalia's border into Kenya. He says they bribed policemen at the border and hid grenades among food. The former al-Shabab recruit said he had never met foreign fighters but he was aware there were three Arabs and one white man who delivered arms to his unit. He insists he is no longer working with, or affiliated to, al-Shabab. And he says he was able to leave the group because they believed he was returning to Kenya to carry out attacks. He says members of al-Shabab ordered him to bomb a market in Nairobi in May. However, he told them he was unable to do so because he was known in the area. Nairobi's Gikomba market was bombed on 16 May 2014, with 12 people killed. Now the former al-Shabab recruit says he fears for his life if he refuses to take part in future attacks. In a slum, on a muddy, smelly street amongst the rows of tin shacks, we speak with three women. On 5 May 2012, Amina's 29-year-old husband left the house and never returned. Halima's brother left on 27 January 2011. And Mwanaisha's 14-year-old son left in August 2009. All three women are convinced their relatives left Kenya to travel to Somalia to fight with al-Shabab. In fact Mwanaisha received a phone call from her son two months after he left, confirming he was fighting with the Islamist group in Somalia. "I don't know if he is dead or alive," she tells me. "I have given up hope." Amina has not given up hope that her husband will, one day, return. But she is certain that he left to escape the poverty of the slum. "He had no means of making money here," she says. "The recruiters offered him money." Amina, Malima and Mwanaisha all told me there was "zero" trust between people living in the slum and the police. But the threat posed by young Kenyan men being radicalised by al-Shabab, fighting in Somalia and then returning home to carry out attacks, is real. 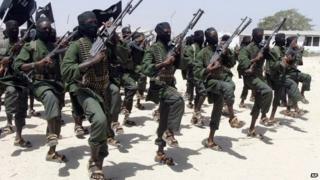 Nairobi-based security analyst Mwenda Mbijiwe estimates that a quarter of al-Shabab fighters are Kenyan. "Al-Shabab is a big threat to Kenya," says Mr Mbijiwe, whose security company is called Eye On Security. "They [al-Shabab fighters] hold Kenyan passports and Kenyan ID cards. They are our sons and daughters. For them to come back home is so easy." But with so little trust between the police and the local community, and in particular Muslims living in places like the Majengo slum, there is little or no sharing of information. The treasurer at the main mosque in Majengo, Mohammed Said, says the police often carry out searches of the mosque based on what he believes are "rumours, falsehoods or unreliable sources." It is a criticism the Kenyan police service rejects. However, Mr Said praised the "respect" shown by police officers who searched the mosque last week, the day after al-Shabab killed 36 quarry workers in the north of the country. Mr Said insists his mosque is ready to assist the police, to stop any youths in the area becoming radicalised but he says more trust is needed. "Before they start accusing us, we would like them to at least start co-operating with the Muslim leaders here," he says. Kenya's president recently said his country "was at war" with al-Shabab. Uhuru Kenyatta was defiant following al-Shabab's most recent attack in Kenya. He said the Kenyan military would continue to fight the militant group in Somalia. But the Kenyan authorities also need to start addressing the propaganda war back home.